Just a short note to let you know of a few updates here at Paradise. We have renamed our restaurant “The Garden Restaurant & Bar” after our head chef James Garden and the wonderful food he has produced for our guests over the past 8 years. We also have a beautiful new addition to our restaurant with a huge undercover deck area leading out from the restaurant via glass doors. With a seating capacity of approx. 180 guests, this will enable us to hold much larger events/conferences in the hotel. We are extremely fortunate here at Paradise to have 3 fulltime chefs to ensure our restaurant can be open 7 days per week for breakfast/lunch and dinner. 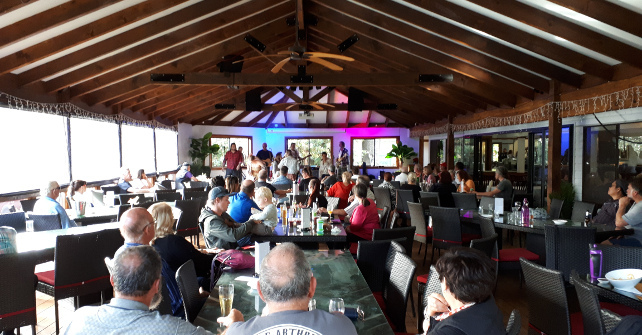 We are also holding “Sunday Sessions” every Sunday from 1-4pm on the Garden Deck with live music, happy hour drinks and well-priced snacks for our guests which has filled a gap for visitors to Norfolk with little to do on the island on Sunday afternoons. Another upgrade has been with our furniture finally arriving via 2 charter airplanes this month. We have now replaced all our indoor, outdoor, restaurant & room furniture with lovely new & comfortable seating which has given the hotel a well needed lift. Also currently we are three quarters of the way through painting the exterior of the hotel and are extremely pleased with our fresh new look. Attached an image of the new deck also. We will be getting professional photo’s to include the new furniture and paint job at the end of the year!